Held every year at the end of the rainy season, Wodaabe Peul & Touareg nomads gather to refresh their herds in the salty pools near the town of Ingall in Niger before heading south for the dry season. 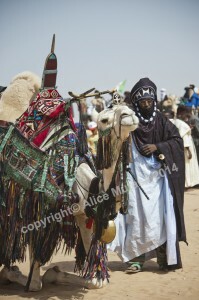 This developed into an occasion for different Touareg and Peul nomadic groups to meet, exchange news, engage in courtship, renew friendships and hold camel races and other contests. Whilst the festival is attended these days by the Prime Minister (himself a Touareg) and the Sultan of Agadez, it still manages to retain a certain sense of authenticity. I have heard complaints however that the event is becoming too closely controlled by the Government (which now sets the date for the festival each year) in its efforts to present the festival as a much-needed tourist attraction. 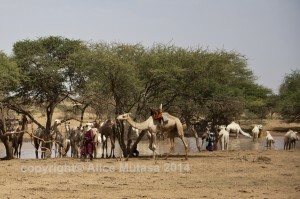 On the way from Agadez to Ingall we pass troops of camels, goats and cattle being led to the numerous pools and other water sources that have appeared during the rainy season. It seems a hopeful scene, after many years of frequent droughts,although it is difficult to get a sense from just passing through of what the true situation is for the nomads and other pastoralists in this region. For the week spanning the festival the narrow streets of Ingall become crowded with visitors; many with camels, horses and other animals in tow. 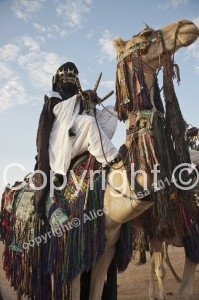 Dust rises in the hot air from the hooves of animals & the sandaled feet of people; the men mostly wearing the long traditional Touareg or Peul robes and ‘chech’ (turban); the women gliding gracefully along swathed in long scarves and traditional African cloths. With its low adobe mud-brick buildings and its dusty streets, Ingall has a timeless, biblical air; it is only the numerous mopeds and cars jammed in the tiny streets that remind you that this is the 21st century…. The festival itself is an odd mix of chaos & formality – although when I think about it both of these seem to be intrinsic features of much West African culture I have come across. There is a program, but nobody seems to quite know what it is. I did see one printed copy, but the various events take place in a fairly approximate order. There is some confusion over the camel races that I never quite understood, with some contestants being disqualified and one (or two?) races having to be re-run. Camels and donkeys covered in the most beautiful hand crafted leather decorations wander around the site the whole time, in preparation for the best-dressed camel and donkey contests, and raising clouds of dust that are a permanent feature of the festival. Voices over loudspeakers announce the events and provide a commentary in Tamasheq or Hausa, and occasionally in French ‘for the benefit of our distinguished guests’ – meaning me and a group of 5 or 6 Russian tourists, plus a small handful of other foreigners. 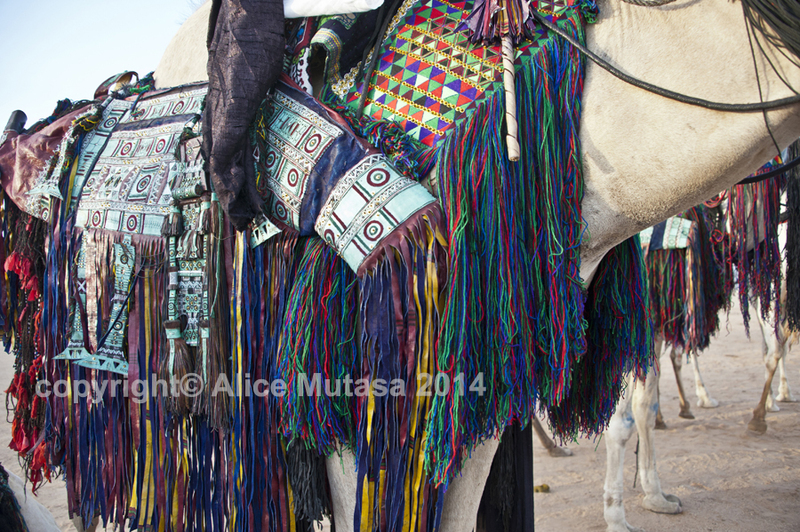 I’m wearing my traditional Touareg outfit that was given to me, and turn round from time to time to catch Touaregs furtively snapping pictures of me on their mobile phones; a pleasant change to be on the other side of a camera lens…. The pale ochre dawn light finds us wandering across an almost deserted festival site in order to catch the finish of the first camel race. 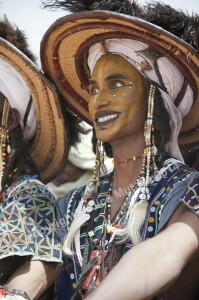 On the way we are diverted towards the Peul camp by the hypnotic sound of Wodaabe singing. 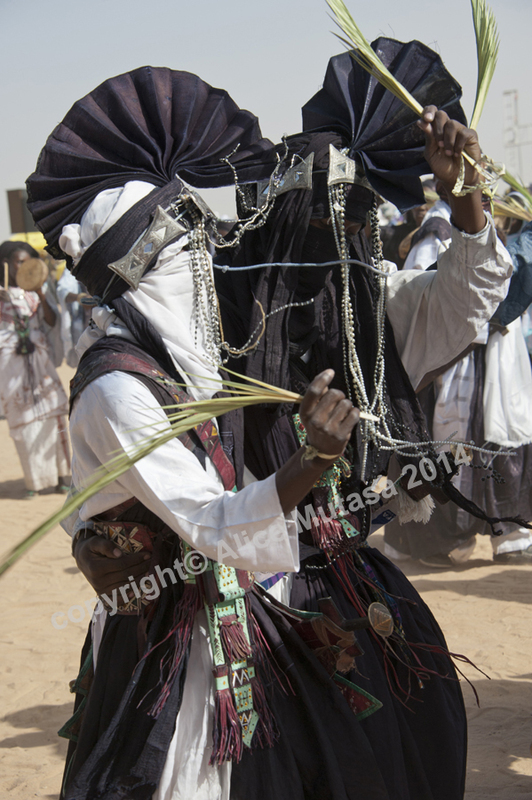 A tight circle of Wodaabe men are performing their traditional chanting – it is a private performance for themselves and their companions, as they face inwards into the circle – the singing accompanied by their traditional graceful, swaying dance. Individual voices lead the singing while others provide harmony and clapping. In the pale still dusty dawn it is perfect, and has the same sort of resonance as a Gregorian chant - if you want a western comparison - although really it is like nothing else you have ever heard…. When they perform later in public in full face paint, we are treated to the celebrated eye rolling and teeth-baring grimaces that the Wodaabe are famous for (if you have never seen this, search the internet for images of ‘Wodaabe’ and you will see what I mean). This is intended to show off their beauty for the benefit of the women (who by contrast are demure and wear little make up), yet to a Western eye the impression given is impossibly camp…. During the ‘camel dressage’ contest (‘le chameau le mieux dresse’) the audience is treated to the dubious spectacle of camels being made to walk on their knees - several are clearly unhappy about the whole procedure and make frightful braying noises as only angry camels know how…. The winners impress the judges by even getting their camels to struggle along the sand on their stomachs towards the judges’ table. Those unfortunate contestants whose recalcitrant beasts refuse to undergo the indignity of the whole exercise are hurriedly ushered away from the competition area…. 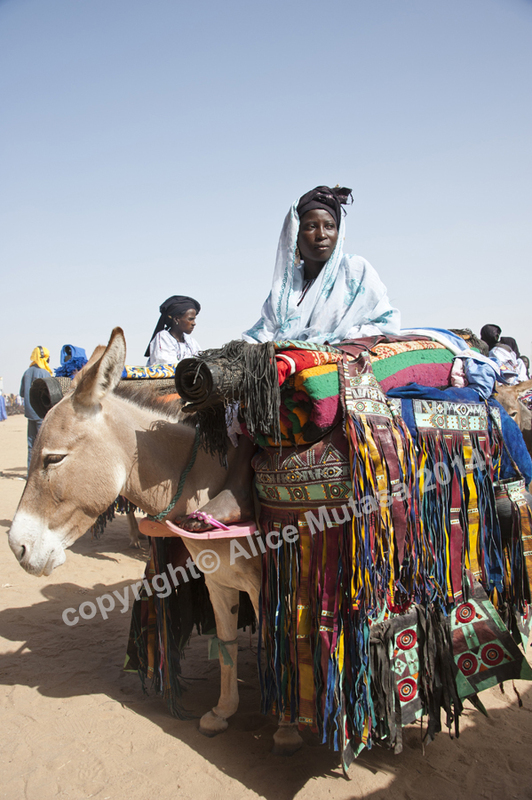 The contests for the ‘best dressed camel’ and ‘best dressed donkey’ are far more tranquil (I can’t find a suitable English translation of ‘le chameau / l’âne le mieux harnache’; ‘harnessed’ doesn’t quite do it!). Camels and donkeys alike are festooned with traditional Touareg fine green and red leatherwork, delicately embroidered with beautiful detailed geometric designs, and embellished with tassles and elaborate silver head ornaments for the camels…. Among my favour ites of the festival are the tende and the ‘Amouloud dance’ contests. The tende groups seem to always play at night; each one representing a town or village in Niger. The tende player carries the beat and rhythm of the whole group; banging out a rhythm on the traditional Touareg drum covered with a cloth that is sprayed with water from time to time. The group is completed by a calebasse (calabash) player and women singers who sway back & forth and clap. The male dancers move in & out of the area in front of the musicians, trying to out-dance each other in an impressive and often acrobatic display of energy, inventiveness and panache. The groups performing the ‘Danse Almouloud’ are the most puzzling but entertaining of the whole event. Their traditional headgear is an extraordinary huge fan-shaped headdress that bobs back & forth as they dance; and many of them wear turbans tightly wrapped around their whole face like a bandage, with only their eyes – often covered by sunglasses – visible. Long chains of twisted black & white rope or beads hang down on either side of their faces. They burst into the central festival space accompanied by much drumming and dancing and waving of what looks like dried palm fronds (although I can’t be sure this is what they are). I asked a number of people but nobody was able to give me an explanation for their eccentric dress. The Almouloud dance is orchestrated by a line of women drummers who sway back and forth, while the men dance in front of them – always in pairs, and still brandishing their palm fronds in the air like eccentric conductors. I have no idea who won the contest, nor the criteria used by the judges, but it is all immensely entertaining. 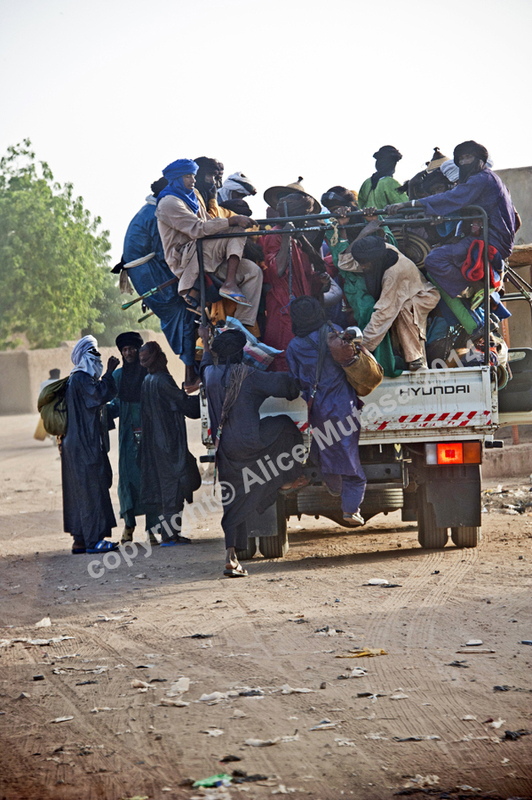 For those of us who are merely passing observers, the end of the Cure Salee signals a return to our own comfortable reality (albeit in my case, via a 19 hour bus journey back to Niamey that included two breakdowns). 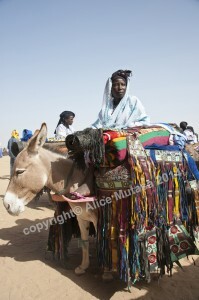 For the Peul and Touareg, the festival can last much longer, after which those who now lead a sedentary life return home to their villages, but for the nomads, their real journey is just beginning …. * For doing it the easy way, there is also a direct flight from Niamey to Agadez that costs around 200 euros return.